Quick description: imagine you use apps like 'conky', 'root-tail' or such and you'd like to have them always in sight for whatever reasons. Now think about what happens when you maximize a window...it maximizes all over your workspace which pretty much covers all those nifty info you'd like to watch. Since fluxbox has this little "prevent-from-max-over-feature", I used to use 'gkrellm2' for viewing my cpu and my memory usage AND, more importantly, as a delimiter for maximized windows. The only problem is that 'gkrellm' runs unstable for me sometimes and it's quite "big" for my little task. 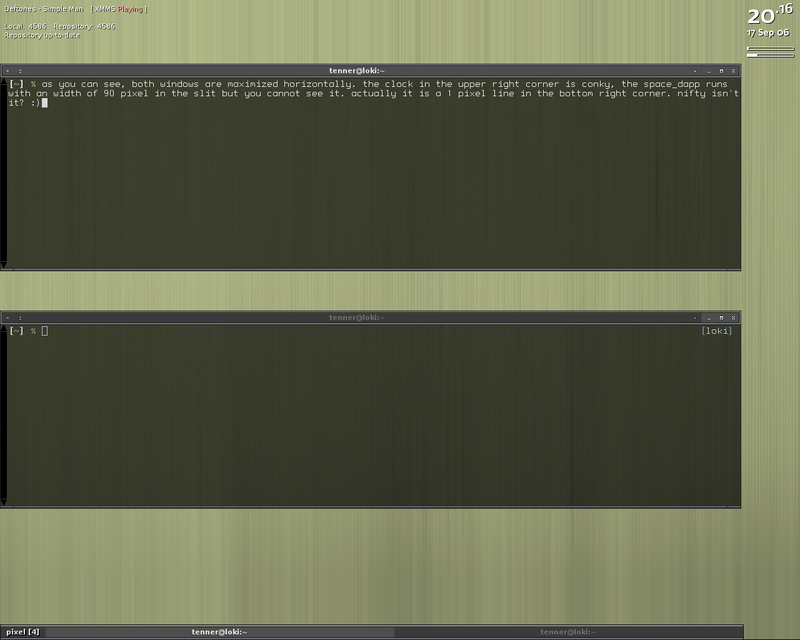 'conky' for example does the same with less memory/cpu usage and I can customize it much more than 'gkrellm'. The only problem to face was that I need to run something in the slit to prevent any window from maximizing over it to keep the space free for my information display or rightclicks to pop up the menu. Thisfor I used 'gkrellm2' as mentioned earlier.